Garmin International Inc., a unit of Garmin Ltd. (NASDAQ: GRMN), the global leader in satellite navigation, announced the next generation of its award-recognized navigation system built into Chrysler vehicles. 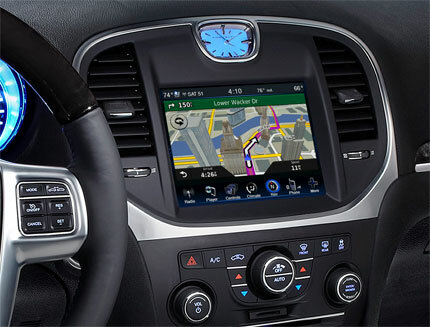 The new Garmin solution is part of the Chrysler Uconnect 8.4N infotainment system and includes several new features and enhancements. It is available for 2013 model year Chrysler 300, Dodge Journey, Charger and Dart vehicles (offered standard on some models and optional on others). New features include 3D buildings and terrain views, improved traffic and routing functionalities, a refined user interface with enhanced colors and themes that are consistent with each vehicle brand and junction views that now cover more than 60,000 intersections across the U.S., among other enhancements. 3D Buildings, Landmarks and Terrain Realistic 3D views of buildings and key landmarks throughout major U.S. cities provide drivers better orientation. Using topographic map data, the new Garmin system also displays 3D terrain views of landscape elevations, helping drivers to see what lies ahead. New, Customized User Interface Garmin introduces a new color configuration and design of its user interface that is customized to Chrysler and Dodge vehicles and provides a more refined look and feel. Trip Planner, myTrends™ and Multi-Route View A new Trip Planner feature allows users to easily plan trips with multiple stops, view routes in an overview screen and edit destinations at any time. myTrends automatically remembers frequent and favorite route destinations based on driving habits and predicts them at certain days and times without the user needing to enter an address. When starting a trip, the new Multi-Route View displays route options, such as fastest and shortest, in one convenient overview map, including time and distance for each, so users can pick their preferred route. New Routing Features and Enhancements Garmin’s new navigation system includes a couple of new features that improve routing. trafficTrends™ predicts traffic conditions and recommends routes using historical traffic data and recurring trends at any given time or day. Garmin’s new point addressing technology enhances routing accuracy, for example, where several addresses of a housing complex are combined into a group of house numbers. The new system can now identify each individual house number and navigate there. Additionally, Garmin significantly improved the routing algorithms to provide even faster route calculations and destination searches. Broader Junction View Coverage Garmin’s exclusive junction view database now includes nearly 60,000 junction views in the U.S. and Canada, 25 times more than in previous versions. photoReal Junction View realistically displays road signs and junctions along the route with photographic detail to clearly mark the correct lane to be in for interchanges and exits. Navigation for Uconnect brings the ease of use of Garmin into an original equipment, in-dash radio. The navigator includes highly detailed maps of the United States, Canada, and Mexico with more than eight million points of interest, as well as many cutting-edge features found in the newest Garmin devices. This includes spoken turn-by-turn directions, one-shot address entry via voice command, lane assistance, junction views, speed limit and current speed, a trip computer and mileage log as well as customized vehicle icons that looks like a Chrysler or Dodge vehicle. In addition to displaying the navigation interface and maps on the in-dash screen, the system also makes use of a second display, positioned behind the steering wheel, to easily let the driver see important information, such as next turn, at a glance.